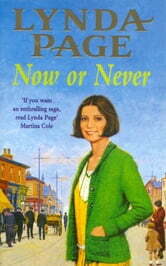 In Now or Never, Lynda Page writes a heart-warming saga of heartache, hope and learning to love again. Perfect for fans of Dilly Court and Kate Thompson. When Maddie Ashman is tricked into giving up her baby for adoption she is utterly devastated. Her mother has convinced Maddie that she has no choice, as the child is illegitimate and the father has deserted her. But this is the final straw for Maddie and she knows she must leave home. It's now or never. But who can she turn to for help? Catching the train to Leicester, she goes in search of the one person who might take her in - even though she has no idea where they live. And when she gets a job in a funeral parlour she discovers that life is full of surprises - for love and laughter can be found in the most unlikely of places!